I'm a big fan of Robot Koch and his Death Star Droid was the best album of 2009 in Doktor Krank's ranking. Some time ago Robot Koch released an EP with remixes of the tracks from that album, plus one new tune - Blind again featuring Grace who was a guest vocalist on DSD. A powerful, yet fragile, voice of Grace laced with the Robert's fluid beat and a few layers of synths builds up to heavy bass culmination in this much-too-short journey. Another new work is Robot Koch's remix of New Day, by the Brooklyn-based Body Language (they release stuff on Machine Drum's Normrex). I don't know the original but this remix has a peculiar neon quality, reminding me strongly of sunny LuckyMe stuff. 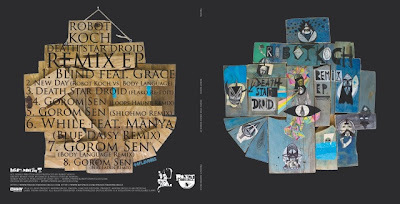 Then, fLako steps in with a heavily glitched up edit of the title track Death Star Droid - for me the highlight of the entire release next to the Phon.o's remix. Loops Haunt mercilessly throws his sick drums, kicks, pads, bass or whatever he seems to have at hand into one boiling and twisting off-beat syncopation in his very unique vision of Gorom Sen. Another remix of Gorom Sen by young, talanted beatmaker from LA - Shlohmo, has already made some rounds in the blogosphere before the release. Future beat par excellence!! Blue Daisy takes the listener to a dreamy fairyland for a trippy ride through etheric sonic landscape which virtually desintegrates into nothingness 'in front of our ears'. TUNE!! The successful release is crowned with fantastic Phon.o's remix of Gorom Sen. It's a great dancefloor-oriented roller with beautiful synths and pumping beats. You will be hooked up instantly with infectious '8-bit meets oldschool garage in Berlin' type of aesthetics. Cop it and blast it looouuud!